The Gasparilla Music Foundation is a Florida 501(c)(3) non-profit corporation that organizes the annual Gasparilla Music Festival in downtown Tampa the second weekend of March. 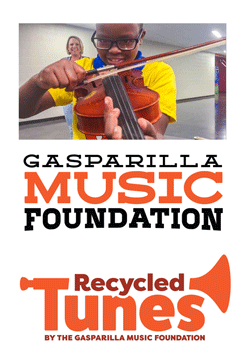 As part of its mission, the organization operates throughout the year to support music education and local musicians through its Recycled Tunes and GMF Productions programs. The Gasparilla Music Foundation is supported by local businesses, its Higher Ground members, and individuals who believe in BUILDING A BETTER COMMUNITY THROUGH THE ARTS.